Following the New York Giants surprising trade of Odell Beckham to the Cleveland Browns, one of the big questions people were asking was who will Eli Manning have to throw to and who will be a reliable source of offensive production outside of running back Saquon Barkley? Beckham was one of Manning’s biggest pass threats, and with his departure, it’s hard to see anyone else making the plays he did that completely smashed numerous NFL records and earned the respect of the opposing defense. Current receivers like Sterling Shepard and Cody Latimer have some potential, as was seen this past season, but the Giants need that one guy who can fill the No. 1 role. With one of the team’s most recent moves, it’s possible that they may have found that guy. This past Thursday, the Giants and wide receiver Golden Tate agreed to a deal bringing the former Seattle draft pick to New York for four years and $37.5 million with $23 million guaranteed, per a source close to ESPN. After playing half of last season with the Philadelphia Eagles where he couldn’t get integrated into the offense despite being a top slot receiver, Tate comes over to a team and system that he feels he can get adjusted to and contribute fast. Along with the Eagles and Seahawks, he also spent some seasons with the Detroit Lions. For all the statistics junkies out there, Tate’s numbers are respectable given that he’s been on teams who’ve had multiple talented skill players to share the ball with who’s systems “didn’t always work” with him. Over his nine seasons in the NFL, Tate has racked up 611 receptions for 7214 yards, averaged 11.8 yards per reception, and scored 38 touchdowns. 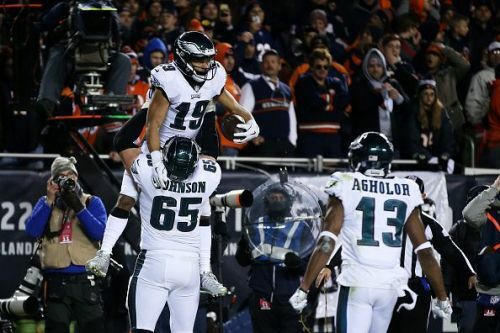 The frequency with which he provides offensive points isn’t the highest, but he seems to show up and make big plays when they matter most, just ask the Chicago Bears about this year’s wild-card matchup. Tate’s prowess as a slot receiver came from his time in Detroit. From 2014 to midway through the 2018 season when he was traded to Philadelphia, his presence brought to the Lions, and hopefully will to the Giants, a weapon to use in the slot or out wide on long yardage situations. In three of those four seasons, a majority of the games saw him average double digits for average yards per catch. This might provide some competition for Giants receiver Sterling Shepard, as he was Eli Manning’s target not only after Odell Beckham got hurt, but in long yardage slot situations as well. His speed is also something to mire, as Tate clocked a 4.42 40-yard dash at the 2010 NFL Combine. Obviously, a lot of Giants fans’ emotions were boiling following the trade of their generational star OBJ, but maybe they can ease their anguish a bit. Certainly, Golden Tate’s stats through nine seasons are incomparable to what Beckham has accomplished in five, but the signing isn’t a bottom tier signing. If anything, Tate will add a little strength to an offense consisting mostly of Saquon Barkley, Sterling Shepard, and Evan Engram and will give Eli Manning another guy to look for when the pressure is in his face. Welcome to New York Golden Tate!